The end of the mini-series Avengers & X-Men Axis came on Christmas (well, Christmas Eve, technically) with the release of Axis #9, drawing to a conclusion the third action – Book Three: New World Disorder, comprised of issues Axis #7-9. Was this a gift because the finale was stunning or simply because the series is now finally over? Unfortunately, my view tends more towards the latter. The first Act of Axis, called “The Red Supremacy,” was a promising beginning as it brought a long-brewing fight between the Red Skull and the Avengers Unity Squad to a head and flipped the present heroes into villains and vice versa. The second act “Inversion” explored what steps the evil heroes and heroic villains take with their new personalities. Act three brings everything to a close in a way that more or less resets everyone – with a few exceptions – back to their original orientation. A lot of stuff happens in Axis #7-9, but it doesn’t really feel significant. 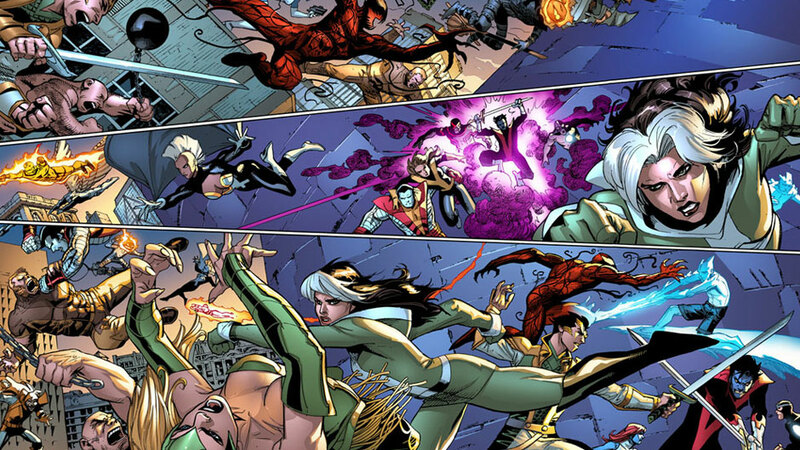 The X-Men threaten New York with a “gene bomb” that will kill any non-mutants. The science and practicality of such a bomb are better left unanalyzed. The Avengers have imprisoned their non-inverted teammates and seek to find the Red Skull, who could re-invert them all. 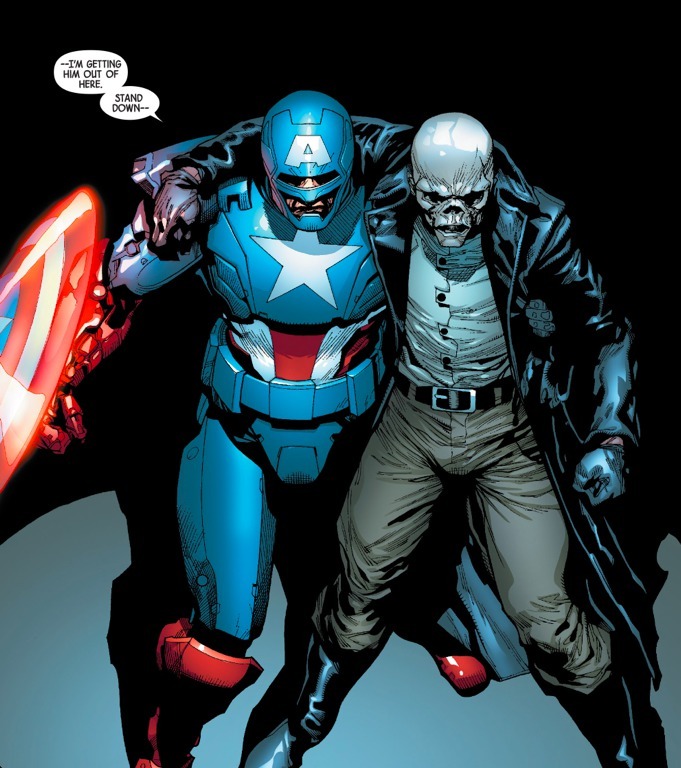 However, old Steve Rogers rescues the Skull, now called the White Skull (which seems weird considering his past affiliation with Nazis), while the inverted villains become Avengers. Oh, and Carnage was exploded and Deadpool was torn apart and beheaded by Genesis/Apocalypse (neither of these were as exciting as they may sound). The art on Axis #7-9 is quite a mixed bag because there are so many different artists working on it. Adam Kubert handled Axis #7 and this was probably the best art of the Book Three issues. Leinil Francis Yu drew Axis #8 and while his characters with masks (such as Spider-Man) look very good, he makes human faces appear so wrinkly and weathered, they barely look like people. 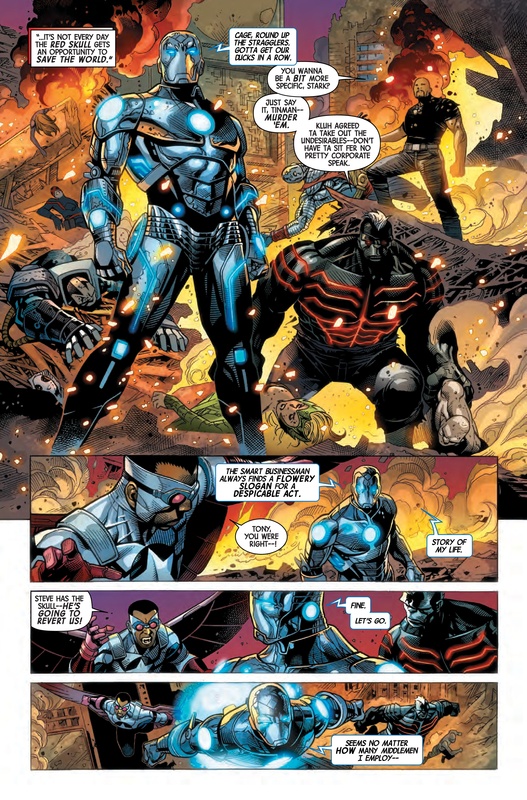 Axis #9 was drawn by four different artists (no, really) – Jim Cheung did the main part, which features excellent art, with Kubert, Yu, and Terry Dodson contributing sections, most of which look rushed and below the artist’s normal quality. Event comics, when they go bad, seem to fail because (1) they are based on an interesting premise but there is no compelling story to build out from that premise; or (2) they seem to simply be a means to an end, a device to set up a new status quo for the comic universe. Axis #7-9 shows that this mini-series had a bit of both of these problems. Inverting heroes into villains and villains into heroes is a somewhat interesting idea, but the rest of Axis felt underwhelming. The problem is that readers know that all of the X-Men and Avengers are not going to remain evil, so the story takes on a bit of a “doesn’t count” vibe since these are characters not acting as themselves. Axis #9 more or less follows this path since at the end most everyone gets set back to their original selves, and the inverted villains claim responsibility for the evil deeds of the heroes, a selflessly noble gesture to allow the public to trust the heroes again (it also stretches believability, but the entire story does that, too). As far as setting up a new status quo, the only characters not re-inverted were ones shielded along with Iron Man – Havok and Sabretooth. So now Iron Man and Havok are evil and Sabretooth is good, allowing him to slide neatly into the Wolverine role (as one of the leads in the new Wolverines series). Iron Man has his new Superior Iron Man series and apparently Marvel is just going with the downward moral spire of Tony Stark since Civil War by just flat-out making him a villain. Havok, as a lesser character, is a little more interesting. We see him join Cyclops at the end of Axis #9, so I’d guess he will be joining the Uncanny X-Men series. A new Uncanny Avengers series, with old and new members, will also debut in the wake of Axis. If these new series were the point of Axis, I feel that we could have gotten there in 4 issues rather than 9 drawn-out ones. Writer Rick Remender is talented, especially when he’s writing creator-owned work, but his work on Axis leaves a lot to be desired. Characters are unrecognizable, a lot of random stuff and characters are thrown out there without purpose (did Colossus have more than two lines the entire series?). He’s not the first good writer to turn out a bad event series (Matt Fraction’s Fear Itself, anyone?). 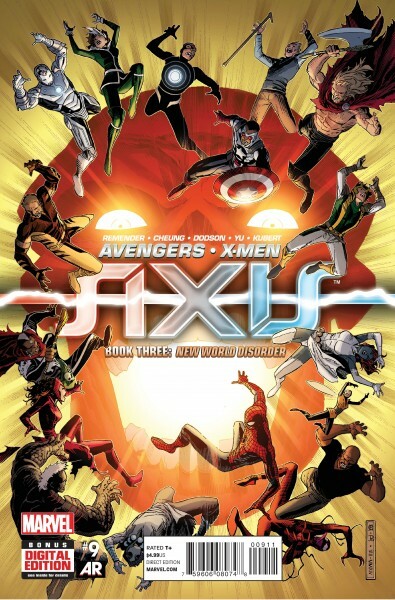 However, it’s discouraging because the lead-up on Uncanny Avengers was strong and “Book One” of Axis was pretty good. As a whole, though, Avengers & X-Men: Axis was unmoving and forgettable.